They are among the world’s most unrelenting truth seekers. In their first live joint appearance, these renowned, award-winning journalists and authors will discuss the pressing need to apply constant, critical pressure on an American president who threatens the very fabric of democracy, journalism, civil society and the truth. In this two-part Toronto event, our first discussion features Amy Goodman, host and executive producer of Democracy Now! ; Juan González, co-host of Democracy Now! ; Glenn Greenwald, Pulitzer-prize winner and co-founder of The Intercept; and Jeremy Scahill, war correspondent and co-founder of The Intercept; and Vicky Mochama, national columnist with Metro News. Their conversation will be moderated by Hannah Sung, video and podcast producer for The Globe and Mail. 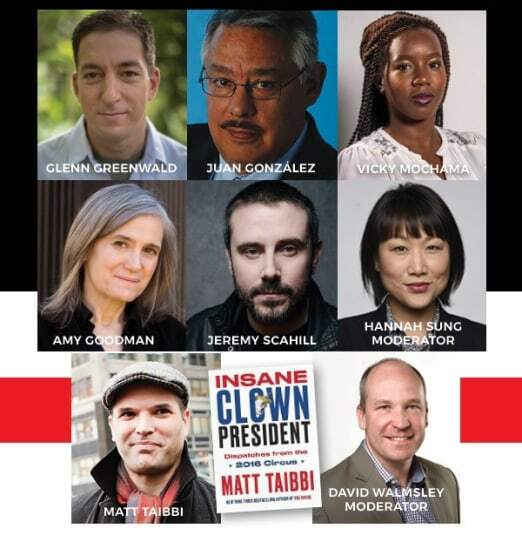 The second discussion features Matt Taibbi, author of the recently published Insane Clown President: Dispatches from the 2016 Circus and contributing editor to Rolling Stone, in conversation with David Walmsley, editor-in-chief of The Globe and Mail, on journalism’s response to this ongoing circus and chaotic presidency. Books will be available for purchase at the event (cash only). The Canadian Journalism Foundation promotes excellence in journalism by celebrating outstanding journalistic achievement. Our signature events include an annual awards program featuring a must-attend annual industry gala where Canada's top newsmakers meet Canada's top news people. Through J-Talks, our popular speakers' series, we facilitate dialogue among journalists, business people, academics and students about the role of the media in Canadian society and the ongoing challenges for media in the digital era. The foundation also fosters opportunities for journalism education, training and research.